An elegant smooth Gin – like a magic carpet ride of the botanicals. Citrus peel is present and balanced with a small amount of star anise, coriander seeds, cardamon and orris root all beautifully balanced with the juniper. This Gin is becoming a popular product for those that visit the McHenry stall at Salamanca Market. Notes provided by McHenry and Sons. 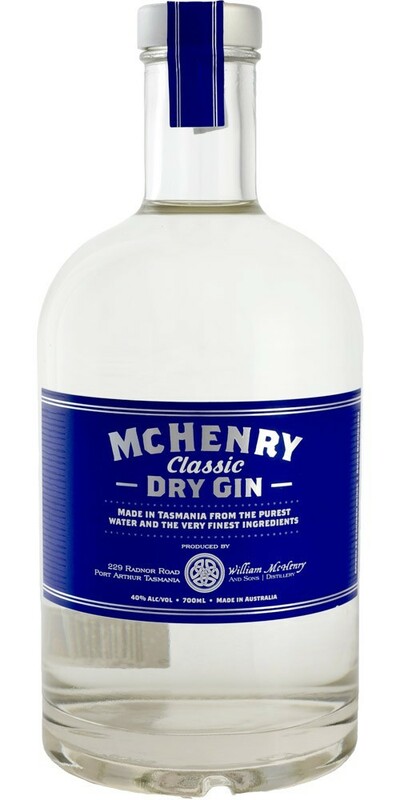 William McHenry & Sons Distillery rests on the side of Mount Arthur, located on the Tasman Peninsula. Mount Arthur stands sentinel over Port Arthur, with its deep harbour opening southward into the Great Southern Ocean. McHenry and Sons Distillery is Australia’s southern-most whisky distillery, its location taking advantage of the cool-moist-maritime environment, giving the maturing spirit the right conditions to make the most of its time in the wooden barrels. The William McHenry & Sons Distillery uses a Tasmanian made water-jacketed electrically heated 500L pot still. This allows the distiller to precisely control to the distilling process and means products from the distillery are of the highest quality.